Today would have been Dr. Martin Luther King's eighty-second birthday. I wish he would lived to see the progress the United States has made as a people to become more tolerant of those who are not the same as the majority. How much progress have we made? There is no doubt that the American Civil Rights movement has brought about change in regards to attempting to set an equal playing field amongst a group of people who belong in the same nation. I question why this even had to be an issue in the first place. History states that descendants of the Europeans and the British who wiped out the gracious Native Americans felt the right to enslave a whole group people on the basis that they were different. Needless to say, civilizations around the globe have employed others as slaves. What gives any group of people to treat another group of people as inferior? Upon what basis is the justification of mistreating others acceptable? Why is it that ethnicities for the African-Americans, Hispanics, Asians, and Pacific Islanders in America is actually an element that still proves to be a disadvantage? I can not wrap my mind around the notion that being different is a bad thing. Just because someone is different does not make them bad. Not understanding someone's customs does not make them any less or more. Xenophobia is a foreign notion to me, yet I realize it runs rampant in the realm of society and politics. As a Filipina in the US, I have thankfully not seen the staunch and offensive prejudice that has been described to me. There have been a couple of occasions at the most, but for the most part, fitting in has never been a problem. However, I was blown away by a comment a man I once dated made. He said that he did not believe in the Civil Rights Movement. He didn't think that Affirmitive Action was necessary. He was born into a middle-class family and was of German descent. I don't think he'll ever understand. It isn't about race, it's about treating each other like people. We all deserve an opportunity, respect, and justice. Judging someone by the color of their skin is a notion that is alien to me. I don't believe in it. I guess I am considered naive because I believe in loving everyone, giving everyone a chance. 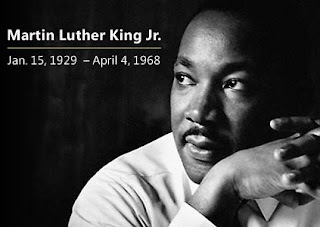 If Dr. King were alive today, would he be proud? Of course we have more work to be done. We still have healing to do after centuries of prejudice and the oppression of those who are different. As a nation, we've come a long way, but we still have a long, long way to go.